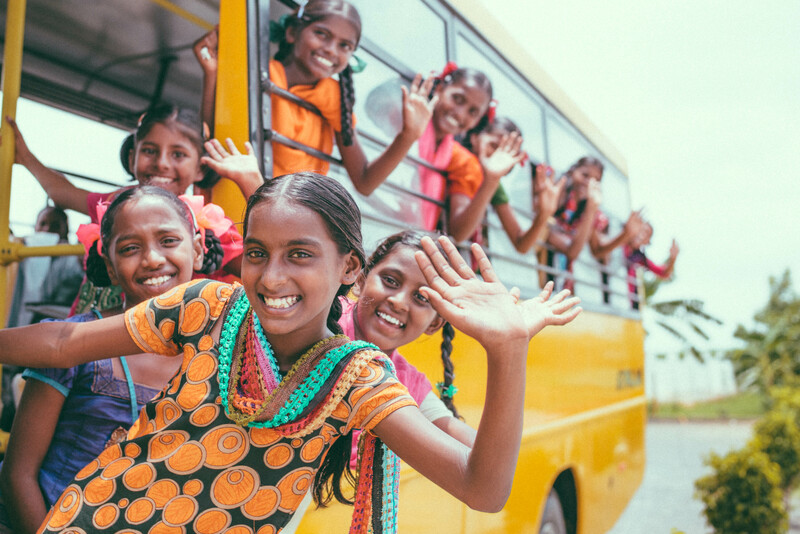 Photo: Girls at our India Girls Home were ecstatic to be the first to try out the brand-new school bus just delivered to our India campus. Thanks to your support, and generous contributions from our donors, our new bus arrived at our main India campus last week! The 31-seat school bus will help us safely transport our older children to a government school where the teachers and students are friendly toward lower caste and Dalit children (outside of the caste system, “untouchables”). Our 1st-5th grade students (ages 5-12) attend classes on campus, at our own accredited elementary school. In addition to the older children’s safety, the bus meets one of the bigger requirements of obtaining accreditation for our own on-campus junior high and high school: having a school bus. We can now also take the children on fun excursions and sightseeing trips — there is a beautiful beach not far from the campus, but previously we had no way to take the children there. The children are very thankful for the new bus, a great blessing in their lives. We are also happy to report that we have 15 new girls and 6 new boys living on our main India campus, where they are now safe from the dangers of child labor and the trauma of child marriages. One such girl recently rescued from child labor is Nandhini, who is 8 years old. Her father is disabled and is not able to work, and her mother was previously a maid servant in houses where she washed their dishes and clothes as well as some other labor from morning to evening for about $2.00 a day. When she returned from her work, she brought some leftover cooked rice from the houses where she worked. Along with the rice, Nandhini’s family would be lucky to mix some lentils or tomato soup to complete their meals. Many days they lived without food, and they got by with only one pair of tattered clothing each. With Nandhini’s father not able to work, and her mother not able to feed her family, their lives were further complicated when her mother encountered health problems making her unable to work. Nandhini’s family was homeless, living by the roadside. Without any other choice, they sent Nandhini to pick rags from the trash heaps to be sold to the factories for industrial use. Nandhini would also go house to house to beg for food with her mother. In complete despair with no way to work, and living homeless on the roadside, Nandhini’s mother was contemplating suicide. It was in this dire situation that she heard about our Girls Home on our main India campus through a village woman who had compassion on their situation. So she brought Nandhini to our home and enrolled her with us. 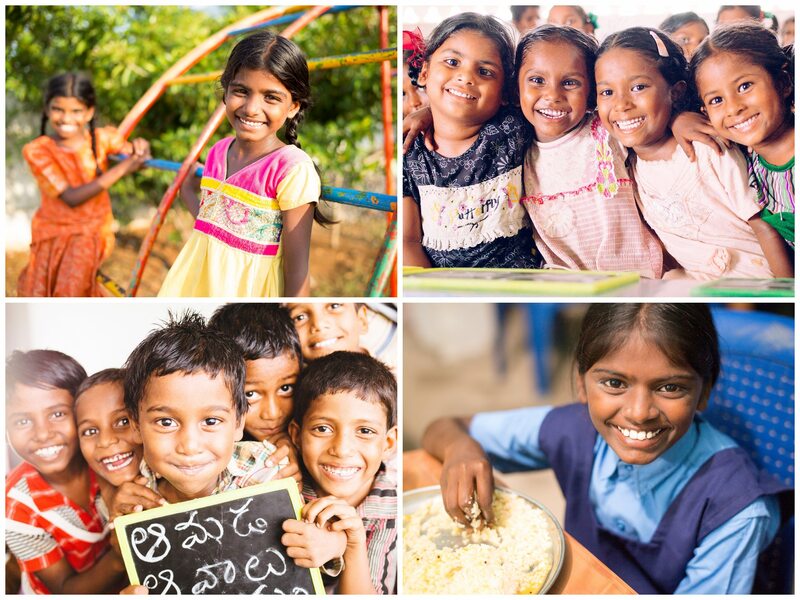 Now Nandhini is very happy: she is attending our school, eating nutritious meals three times in a day, sleeping in a comfortable bed for the first time in her life, playing with new friends on the playground, and is grateful for a big family to support her in her development. Photo inset: (Top-left) Newly rescued girls enjoy time together on the playground at the orphan home. (Top-right): These girls at the home are thankful for newfound friends and the opportunity to attend school. (Bottom-left): Boys from our orphan home are excited for another year of learning at our onsite accredited school.. (Bottom-right): A girl at our home is very pleased with the new menu designed by our recently hired nutritionist. We are also thankful to be making improvements to our rooftop box gardening project after it was damaged in a recent storm. The awning protecting the garden from direct sunlight has been strengthened to help guard against future damage. We were able to get a small harvest of vegetables before the storm and we are encouraged by the results. However, we know that we can do more, and we have plans to expand the project. There is plenty of space to add about 15 times the amount of harvestable green space on the rooftops. We are hoping that the funding needed for the project expansion will be provided soon. Our gardening project on the ground level is going well — eggplant, tomatoes, and other vegetables and herbs were just planted. The harvests of organic vegetables from both the ground level gardens and the rooftop gardens are used in the children’s meals. We recently hired a nutritionist to plan out our menu for the children, and hired a new cook and assistant cook to help meet the requirements. The plan includes 3 square meals and an after-school snack. Preparing 288 meals and 96 snacks daily for all the children of the Girls Home and Boys Home, not to mention meals for our staff, is a daunting task, yet it is one that is pulled off deliciously. Lastly, the older girls of the Girls Home have now settled into the new 3rd level upstairs space. They are so happy there, with the freshly painted walls and abundance of sunlight that comes through the large windows. However, they still need to go down to the second level to share bathroom space with the younger girls, and that is another area we hope to find funding for soon, to build out the space designated for more bathrooms on their level. Our hopes and dreams for our main campus are to see more of the children sponsored, for our grounds to be abundant with flourishing garden projects, to continue to expand the school building, and to buy more land for future projects. Thank you for your prayers and contributions — we look forward to reporting back with our progress in improving the lives of these children.